Posted on August 17, 2015, in Authors from...., Man Booker Prize, Sunday Salon and tagged 2015 Man Booker Prize, Mark Henshaw. Bookmark the permalink. 16 Comments. Thanks for you Booker comments. I cannot get into The Illuminations – out it down halfway through thinking I may go back later. After reading your comments, maybe I won’t. 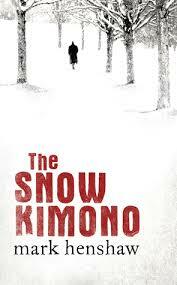 Looking forward to checking out The Snow Kimono – thanks for the tip. Stories like Henshaw’s route to publication (I’m also thinking of Eimear McBride who won the Orange Prize for her much-rejected novel) are so inspiring. Love the sound of it being a “puzzle”. Hope you are pleasantly surprised by what remains of your BP reading! sometimes the story behind the book can be as interesting as the book itself. though not in this case! I haven’t read any of the titles in the Booker Longlist…I don’t know where to begin. But the Snow Kimono does sound interesting. My path through the longlist was purely down to what was available via the library. It’s a mystery, isn’t, what goes on in the minds of the judges? I’ve yet to come across anyone reading long list who has declared they have read the book that should win. Maybe its all a cunning plot by the publishers to get us buying more books?? Love the sound of The Snow Kimono. I’m going to start reading A Little Life this week so would love to hear your thoughts! I don’t think I will be reading The Green Road as I was put off by The Gathering which I didn’t enjoy very much. My library doesn’t have the best record when it comes to Aussie authors but they have The Snow Kimono! Off to check it out. I was surprised my library had this but more than delighted they did. Its one of those books that make me stay up until very late because I can’t stop reading it!